GivGro leverages the power of technology for the non-profit sector to grow the value of every dollar; empowering donors and charities. 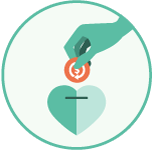 Donations made through the GivGro platform will be pooled in an investment fund, managed and grown by trusted financial partners. Every fiscal quarter, donors will receive returns on investment from their donations to distribute among our valued charity partners across a number of causes. Invest Your Funds And Watch It Grow Forever.